The word Jook is an old African-American term, meaning to dance, sometimes used with sexual connotations. It has also been suggested that the Southern jute crop fields had workers who frequented low class road houses or makeshift bars, which were called juke (or Jute) joints, where these early Jukeboxes would appear. Whatever the origin, the juke joint was a spot for dancing, and the jukebox provided the music. By 1927, The Automatic Music Instrument Company created the world's first electrically amplified multi selection phonograph. With this amplification, suddenly the Jukebox could compete with a large orchestra, for the cost of a nickel. Prohibition assured the jukeboxes success, as every underground speakeasy needed music, but could not afford a live band. Tavern owners were privileged to have a jukebox, which drew in customers, and was provided by an operator at no charge. The importance of the jukebox to Bluesmen, and the White Country and Rockabilly artists at Sun Records cannot be underestimated. Much of early radio was live concerts staged at fashionable hotels, like the ritzy Peabody Hotel's Skyway broadcasts where a young Sam Phillips started his broadcasting career. These radio concerts were of respectable music of the day; light Classical, Swing, Jazz orchestras, or show tunes. The lower class Blues "Race music," or Rockabilly, were not held in high esteem as worthy of a radio broadcast. So Arthur "Big Boy" Crudup, Muddy Waters, Bessie Smith, Roosevelt Sykes, and Carl Perkins with their wild rebel music had to find another medium. Aside from the Chitlin Circuit (Black patrons and musicians), the jukebox was the only place to hear this type of music, from the late 1920's until the late 1950's. In it's heyday, the juke box provided the power to sell hundreds of records at once for artists like Chuck Berry, and Jerry Lee Lewis. The jukebox was color blind in a segregated world. Black patrons thought Bill Black, Carl Perkins, and Steve Cropper were Negroes singing, while White patrons, were exposed to, and accepted Black artists work, never having seen the performer in person. 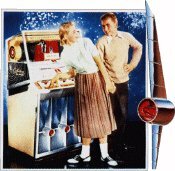 After the depression, jukebox sales rose dramatically, as leading manufacturers Wurlitzer, Seeburg, and Rock-Ola, devised spectacular creations of wood, metal, and phenolic resins which danced behind tubes of enchanting cellophane, Polaroid film, and plastic. Interestingly enough the Rock-Ola name had nothing to do with Rock n' Roll. Like Seeburg, and Wurlitzer, it was the last name of the companies founder, Canadian David Rockola. During World War II from 1942 till early 1946, jukebox production was halted by the US government to conserve labor and materials for war efforts. Wurlitzer's 1946 model 1015 was the most popular of the era with more than 56,000 units shipped under the slogan "Wurlitzer Is Jukebox."